Discovery 20 w/ Impedance Lid - BrainMaster Technologies Inc. The BrainMaster Discovery 20 channel biofeedback device introduces a new price and value point into the world of EEG and qEEG. It is quite simply the most affordable and versatile whole-head EEG, with high-quality clinical grade EEG acquisition and a large range of available software and features. Like its big brother, the Discovery 24E, it provides 24-bit conversion with an internal sampling rate of 1024 samples/second and 256 sps data rate to the PC, providing 20 high-resolution and aliasing-free signals. It has a bandwidth of 0.000 to 60 Hz, providing accurate recording of EEG from DC offset up to gamma and above. It operates with the full range of BrainMaster 4.0 software, including the BrainAvatar package, as well as compatibility with industry-standard packages such as BrainDX, NewMind, WinEEG, SKIL, EEGLab, NeuroGuide and others. Discovery 20 recordings can be used in virtually all types of analysis, and provide noise-free signals suitable for mapping, Z-Scores, live Z-Score training, and live sLORETA imaging and Z-Scores. With true DC capability, it excels for use in Slow-Cortical Potential (SCP), or Infra-Low Frequency (ILF) or Infra-Slow Fluctuation (ISF) research and clinical practice. The optional impedance-sensing lid is also available. A new built-in continuous impedance monitoring capability is now available as an option with the Discovery 20 amplifier. Using the same proven approach as the Atlantis devices, this hardware upgrade can be provided for any existing Discovery amplifiers, providing continuous measurement of all sensor impedances. 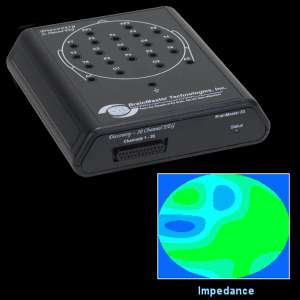 Sensor impedance values can be read into the BrainAvatar 4.0 software (optional) and displayed on a live head map, revealing instantaneous and continuous monitoring or sensor impedance values.